Hunter Donovan’s life always seemed perfect, but there was something rotten beneath the shiny surface. When the truth comes out and his dad is sent to prison, Hunter can only react with anger. His rage boils out of control, leading to a violent incident at school, and then to Hunter being sent to a mental health facility—Better Days. Hunter doesn’t see how therapy can help him. If it can’t change the past, what good is it? It’s not like he can go back in time, see the horrible things going on right under his nose, and put a stop to them. No, he should have found that strength when he had the chance, and now it’s too late. There is a ray of light at Better Days, though, in the friendships Hunter forges. Anxiety-ridden Casey, uninhibited Rosie, recovering bulimic Bethany, and Stray, a self-harmer who’s never had a home, lighten Hunter’s feelings of isolation. Despite the connections he’s forming—and even the love blossoming between him and Stray—Hunter can’t escape his shame and remorse. If Hunter can’t open up and find a way to deal with what happened, he might end up another casualty of mental illness, just like one of the friends he’s grown to love. Turn the World Upside Down was a difficult book to read, as well as review. The dark subject matter was handled with compassion and from a different point-of-view meant to open minds and widen perceptions. I applaud the author for tackling such subject matter in the manner in which it was handled. When bad things happen in a family to a singular person by another family member, usually everyone rallies around the victim, leaving the rest of the family to be in the supportive role. But, the problem with this, while the victim needs the attention and compassion, the entire family was the victim as well, leaving other siblings in the dark – forgotten. Turn the World Upside Down was the voice of those usually forgotten in the shuffle – not the direct victim, but still someone affected by the events, but nonetheless forgotten. I appreciate this differing viewpoint, and it was refreshing to read how the author enlightened readers on how this devastates an entire family, each member in a different way. Hunter is the older brother of a little sister who was abused. He feels responsible because he was the brother, and it's his job to take care of his sister. He feels responsible for not hearing his sister when she asked for his attention as a buffer, even if the only way to interpret her words were afterward because Hunter was not a mind-reader. His guilt is eating him alive because he loved the abuser – idolized him – instead of seeing what was subtly hiding beneath the surface. The truth. Angry at the world, but mostly himself due to misplaced guilt, Hunter rages, unable to release the tension on the only person it belongs. I understood Hunter, because I, too, don't believe in burdening others with my feelings, as their feelings are more important and I feel my emotions are private – none of their business unless I feel like sharing. This rage built until Hunter could no longer contain it, causing his mother to send him to a camp for children with mental illness. Not only is he raging, he feels abandoned, but also understands how his behavior is taking away from the attention his sister needs. But Hunter needs attention too, because he's hurting in a different way. On the pages of the novel, the reader is taken on a six-week journey as Hunter comes to terms with his emotions, learning he has no fault in what happened, and makes friends with other teens who are struggling. Even with his new friends, Hunter feels as if he needs help the least, worrying about their issues more than his own, in a place where the teens all have an equal voice and need for help. The difficulty with the novel is the tough subject matter involving not only Hunter's past and present, but the friends he makes. All have tragic mental illnesses. I couldn't help but feel that the last thing these kids needed to be around were more tragedies they would internalize and devour as if it were their own pain – it didn't feel healthy to me that Hunter would have to be in a place to heal with other children who were hellbent on making his wounds worse, while he dealt with everyone else's issues instead of his own. While I understood the why of it, and applaud the author for showing this side, the entire situation didn't feel healthy to me. Forging connections and helping one another is fantastic, knowing you're not alone with your mental illness is a comfort, but making and losing friends due to their mental illness, while their illness writes its signature on your psyche is not healthy, especially with the bullying behind the scenes by other teens. Hunter shouldn't have had to deal with everyone's issues when he should have been dealing with his own, compounded by the devastation of losing new friends and being bullied/beaten, all of which were new stressors added on top of 'his' issues. It felt worse, not better. It just felt as if the child didn't have the fortitude and family Hunter had, they didn't have a snowball's chance of healing due to the influences and pressures from the people in the very place they were placed in order to heal. Counterproductive, trying to find positivity in a negative environment. The saying 'misery loves company' doesn't mean they ban together and find happiness – it means they dwell together in their misery, making it worse. I understand it, appreciate the angle the author provided, but I don't believe this type of environment is healthy for anyone – anywhere, even if it's reality for so many. All of the characters were compelling, heart-breaking, and innocent in their mental illness, yet also manipulative and toxic as they tried to keep their issues alive. The friendships forged were inspiring, yet sometimes enabling and destructive to one another. The romantic relationship between Hunter and Stray was innocent and sweet, filled with hope for the future for those who made an attempt at getting better. All-in-all, Nyrae Dawn created a novel which will make the reader think for a long time after they finish the book, but I can't say I 'enjoyed' it. I do recommend it to those who won't be triggered by the subject matter, and to those in the right emotional mindset to tackle the story. However, I don't think it's a book for everyone – not that any book truly is. I particularly recommend to those who need the comfort of knowing others are going through similar situations they may be in, and to see a differing viewpoint via the victim who wasn't the direct victim of the assailant. Hunter had a voice, and I'm glad I got to hear it. Young adult age-range: 14+ due to bullying/violence, abusive subject matter, mental illness and the effects, and kissing. This is a powerful and difficult story about a group of teenagers with a range of mental health problems. The story is told from the perspective of Hunter, a boy who has not been able to deal with a horrific family crisis. Hunter is a flawed, often self-centred narrator and his observations of his friends and peers in a rehabilitation centre give readers glimpses of each character in the centre without ever fully revealing their problems, emotions, and experiences. Hunter is crippled by guilt and his temper is focused inwards. I found it impossible not to care for him, but his destructive behaviour made him very difficult to like. Hunter’s small group of friends become real characters once Hunter starts to take interest in the world around him. I found it fascinating to piece together each character through Hunter’s observations, even when Hunter himself doesn’t understand what he is observing. This is more of a young adult story with gay main characters than a gay romance. The romance between Hunter and Stray is sweet and complicated, but it really isn’t the focus of this story. The focus is Hunter’s experiences as he struggles to deal with the responsibility he feels for the incident that shattered his family. His relationships – both romantic and platonic – are part of his recovery. This isn’t an easy story with a simple happily ever after. There is a raw honesty in this writing that I found very difficult at times. It is a beautifully written story. The author never talks down to her teen audience and she refuses to offer easy platitudes. It is an important and moving book. This is a story about teens struggling with mental health issues, told through Hunter's time at the Better Days clinic. Self-harm, bulling, sexual assault, and suicide are among some of the issues dealt with in this story. At times it makes for difficult reading and I shed plenty of tears, but I loved these characters and this book with all my heart. I, like many out there, am presently experiencing my own issues and this book hit the spot. In her dedication Nyrae Dawn says "This book is dedicated to you. To anyone who needs it." Well I needed it. Thank you Ms. Dawn. Nyrae gravitates toward character-driven stories. Whether reading or writing, she loves emotional journeys. It’s icing on the cake when she really feels something, but is able to laugh too. She’s a proud romantic, who has a soft spot for flawed characters. She loves people who aren’t perfect, who make mistakes, but also have big hearts. 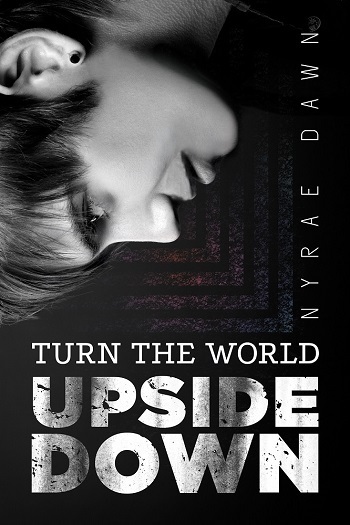 Reviewers on the Wicked Reads Review Team were provided a free copy of Turn the World Upside Down by Nyrae Dawn to read and review.